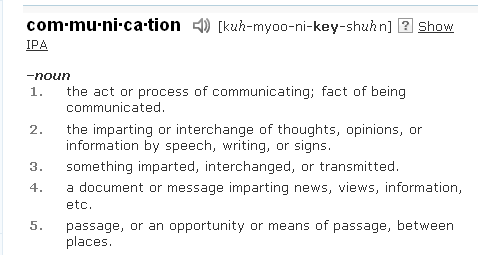 The above is taken from Dictionary.net; I screengrabbed it as I particularly like the ‘interchange’ reference in no.2. I think it’s something that newsrooms can lose sight of from time to time. Blogging remains one of the best learning tools I’ve been given access to; whether it’s from working through my own thoughts and ideas on this blog or reading other blogs (be they the work of friends, journalists, thinkers or achievers) it’s taught, and continues to teach me, so much. In fact, blogging can also facilitate no.3 in this list – passage or means of passage between places – if you define a place as a state of mind. I also find blogging quite comforting – it helps me clarify my thoughts about this industry (and the pace it innovates at), and to read or post responses to the views of others going through similar experience to my owns. In fact, this post was prompted by the need to write something that’s been bugging me out of my system. I call myself a journalist because I trained in journalism and work in the news industry; I call myself a blogger because I (attempt to) impart or interchange thoughts and opinions via a platform called a blog. I feel defined by both these things, and I believe they are in no way mutually exclusive. In fact, I think they are now, more than ever, mutually dependent. And I’m happy about that.